For kids in the sixties who were into superheroes, Captain Action was the man. 13 men, to be exact. With costumes and masks (each sold separately) the Captain could transform into Superman, Batman, Aquaman, The Phantom, The Lone Ranger, Tonto, Flash Gordon, Buck Rogers, Steve Canyon, The Green Hornet, Spider-man, Captain America, and Nick Fury. Like all the best legends, the Captain was fondly remembered in some circles and forgotten in others. The idea of one company producing merchandise based on characters from so many different companies seemed to be an amazing feat that could never be repeated. Joe Ahearn had other ideas. In 1998 he succeeded in bringing Captain Action back through a company called Playing Mantis. Although the Marvel and DC licensed characters proved predictably elusive, the Captain was once again able to sport most of the costumes that made him famous, plus a couple (Hello Kato and Ming The Merciless). For collectors, it was a dream come true. Years later, Joe teamed up with “Retroprenuer” (Wish I’d thought of that) Ed Catto, and together they managed to acquire the rights to the good Captain himself, now appearing in a current comic (DC published an unrelated one in the 60’s featuring art by Wally Wood and Gil Kane) and, best of all, they’ve given him a face lift and a new lease on life. You can now find the new and improved Captain Action figure, as well as Captain America, Spider-man, and Thor costumes in select stores and online. Iron Man, Wolverine, Batman, and Superman are on the way. Through willpower and a lot of hard work, Captain Action Enterprises are on a roll. 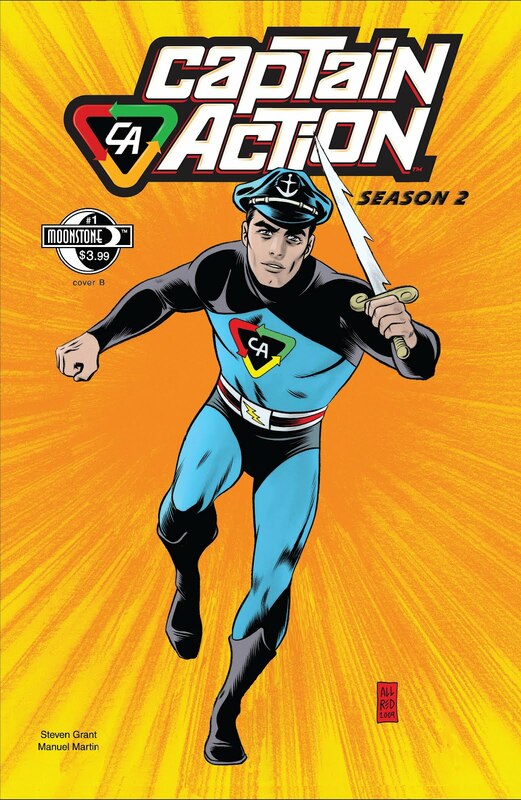 When word came out months back that there would be another Captain Action revival, a lot of people said “Oh, somebody new is trying this again” but that’s not really the case, is it? Ed: Well, as longtime fans and enthusiasts, we aren’t really new. And we’ve been building Captain Action, as well as other properties (including Zeroids and Savage Beauty) for about 5 years. On top of that, Joe was instrumental in developing Captain Action during a 90’s revival. This is clearly a labor of love for you guys. What percentage is labor and what percentage is love? Joe: I’d say 110% on both counts! This was our favorite childhood toy so we love working on this, and we get great satisfaction in what we do and work hard every day doing what we have to do make the Captain Action brand successful. On a scale of 1 to 10, 1 being Sunday in the park and 10 being the leader of the free world, how hard has it been to get this stuff done? Joe: Well, we always had a plan from the get go for Captain Action. It wasn’t just about making the toys. It was about building a brand that could branch out into a lot of directions including toys. We want Captain Action to be more than just a toy. That’s why we began this journey bringing him back in the comics and working on several other projects before even considering revisiting the toy world. But I think the plan speaks for itself given the fact that the new toy line is now being so well received. Ed: With our phenomenal debut, we’ve had a couple of folks call us “overnight sensations”. Well….it’s been several years of working hard, beating down obstacles and convincing people we aren’t totally crazy. So we certainly have not been overnight sensations- and it’s been a lot of hard work. That being said, retailers, fans, collectors, Diamond Distributors, publishers and convention folks have all been encouraging and such fun to work with. There’s a lotta “love” out there too. Scoring the Marvel license is an incredible coup. I know I and a lot of people took a “I’ll believe it when I see it” attitude. Well, I’ve seen it, now I believe it. How did you guys manage to get these out without having to deal with Hasbro? Joe: Well basically, everything we did prior building the brand to a great interest level made this a reality. We spoke to the right people at the right time and were able to make this happen. And several of the Marvel folks have been extremely helpful and encouraging. We do have a very specific agreement with Marvel which allows us to do what we do without infringing on what Hasbro is doing. Any chance we might see characters from other companies? Mike Allred’s Madman comes to mind, I’m certain he would love to have a Madman Captain Action. Joe: Oh yeah, we love Madman and we are big fans of Mike Allred’s work. He ‘s a big Captain Action fan and did a great cover for our season 2 premiere issue. Of course we are also DC fans and would love to work with them as well when the timing is right. We are (shhh) also working on a couple of projects which we cannot reveal just yet. Ed: We both love Mike’s work. I’ve been especially impressed with his recent iZombie work for Vertigo with Chris Roberson. (Despite all the recent controversy.) Mike Allred’s creativity and character Madman is a great example of the type of opportunities we’d like to expand into. I first read about Captain Action as a kid in the 80s, my heart sank because it sounded so great, but I would never be able to afford them .One great thing about you guys is that you’re so clearly enthusiasts and collectors first. Did you guys already have all the vintage ones, or did you recreate them so that you could complete your collections? Joe: Well I had some of the original pieces left over when I was a kid and started recollecting sets in the early 90s which is what lead me to the business side of this scenario first brokering the idea to bring back Captain Action to Playing Mantis in 1996 which came to pass in 1998, and later finding myself in a position in 2006 of acquiring the rights to Captain Action, partnering with Ed and forming CA Enterprises. Ed: I had a robust collection that I started as a kid, then in the 90’s I was introduced to the collecting scene at a North Carolina comic convention. But so much of this is a Odysseus-style quest: two of the costume sets I lusted after as a kid, and never got, were the Spider-Man and Capt. America outfits. So – now I finally got them! One particular Marvel character that existed in the original line but hasn’t been brought back: Nick Fury. He’s a personal favorite of mine and many others, and with his prominence in the current Marvel movies, he seems like a shoe in. Are there any plans? And if there are, I recommend you use his 1960s spy-fi look. Joe: We LOVE Nick Fury and yes, he is on our short list of characters we’d like to do for Captain Action. Sgt. Fury was an original uniform set from the 60s so Nick has a history with Captain Action already, and we’d love to do another version of Nick for the new line focusing on S.H.I.E.L.D. Ed: I echo Joe’s enthusiasm for Nick Fury. I loved the Sgt. Fury and the Howling Commandos series (with that rough hewn John Severin inking) and was enthralled with S.H.I.E.L.D. stories and all things Steranko. We would knock it outta the park with a S.H.I.E.L.D. Captain Action. And hey, I sure would love to see Fury’s girlfriend, La Contessa Valentina Allegra de la Fontaine, as an outfit for Lady Action in the future. I think I still have a crush on her. Thanks again, fellas. Keep up the good work, I’m a loyal customer. Joe & Ed: Thank you! You can read more about Joe, Ed, and Captain Action here.